The announcement that Crown Princess Victoria and Prince Daniel had named their first child Princess Estelle took a lot of people by surprise; it doesn't really ping as "traditional", as names of future Swedish queens go. But while announcing the name in a cabinet meeting the day after her birth, grandpa King Carl XVI Gustaf noted that it was a name close to the family's heart, and many began to connect the name to another Estelle: Countess Estelle Bernadotte (1904-1984), the wife of Carl Gustaf's godfather, Folke Bernadotte. Count Folke Bernadotte of Wisborg, a grandson of King Oscar II of Sweden, was a Swedish diplomat who helped release of thousands of prisoners from German concentration camps during World War II. He was named as the United Nations Security Council mediator for the Arab-Israeli conflict in 1947-48, which tragically led to his assassination in Jerusalem in 1948. American-born Estelle Manville had four sons with her first husband, two of whom lived into adulthood, and she carried on his philanthropic efforts after his death. The couple married in Pleasantville, New York, in 1928. 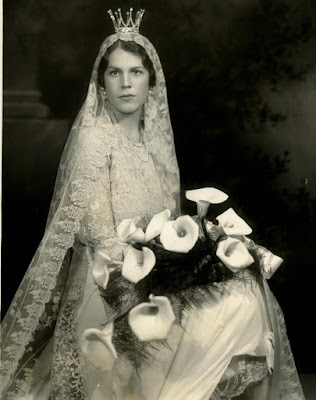 The New York Times reported in advance of the wedding that the bride would wear a veil of Brussels lace inherited by the groom from his grandmother, Queen Sophia of Sweden. The paper also reported that a coronet of silver and crystals was being crafted for the bride by the Swedish court jeweler. The coronet referenced by the Times was a traditional Swedish bridal crown, this version featuring nine points rising from a small circular base. The custom of special wedding headpieces for brides to wear is an age-old tradition in Sweden as well as in other cultures. 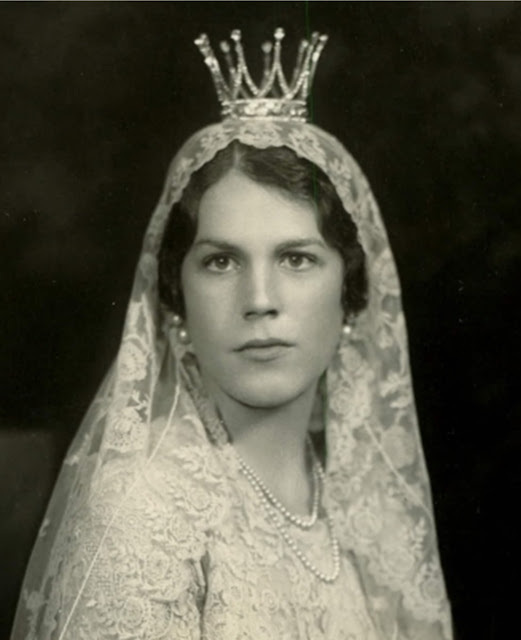 While Estelle's bridal crown was specially made for her, others can be borrowed from churches; Princess Margaretha of Sweden, King Carl Gustaf's eldest sister, wore a large bridal crown belonging to her wedding church in 1964. Like so many old traditions, the use of bridal crowns has fallen out of fashion and they aren't as common to see on a modern bride. And, in truth, many of them aren't great fits with modern wedding gowns; the shape of something like this can be more associated with fairy tale illustrations than with today's weddings, depending on your perspective. Family tradition, however, has given us a few more appearances of Countess Estelle Bernadotte's Bridal Crown. Two of Estelle's daughter-in-laws wore it: Christine Glahns (above) and Rose-Marie Heering, first wife of Count Bertil Bernadotte. Now it is being used by Estelle's grandchildren: Nathalie Frediani wore it to wed Edward Bernadotte, and most recently it has been used by Astrid Bernadotte.